President Donald J. Trump’s recognition of Israeli sovereignty over the Golan Heights upends a half century of U.S. policy. The strategically important plateau has been widely considered under international law to be occupied territory since its 1967 seizure from Syria. In his proclamation, Trump cited security needs as paramount, though in practice Israeli control has not been challenged for decades. Experts warn the move could weaken international prohibitions on acquiring territory by force. Why are the Golan Heights important? The seven-hundred-square-mile Golan Heights overlooks Israel to its west, Lebanon to its north, Syria to its east, and Jordan to its south. During the 1967 Six Day War, Syrian forces on the Golan Heights shelled Israeli farms in the Hula Valley below, and Israeli forces captured the territory from them following the Israeli seizure of the Sinai Peninsula and Gaza Strip from Egypt and the West Bank and East Jerusalem from Jordan. Besides the military advantage of controlling high territory, Israel sought a buffer to ensure water security. At the edge of the Golan Heights is the freshwater Sea of Galilee. The de facto border established in 1949 left Syrian forces at the water’s edge, and Syrian control of its tributaries spurred tensions leading up to the 1967 war. In the 1973 Yom Kippur War, Israeli forces rebuffed Syria’s attempt to recapture the Golan Heights. A disengagement agreement the following year divided the region into three zones. Israel effectively retained control of two-thirds of the Golan Heights and Syria one-third. A UN peacekeeping force continues to monitor the cease-fire agreement’s implementation, patrolling a narrow buffer between them. A month after the agreement, the Israeli government approved the construction of Jewish settlements. Civil war in Syria since 2011 has given the Golan Heights new strategic significance for Israel. As President Bashar al-Assad’s grasp on power appeared tenuous, he bound himself to Iran and Hezbollah, the Lebanese Shia movement, to ensure his regime’s survival. Fighting between rebel and regime-aligned forces brought Iran’s Quds Force, an elite paramilitary unit, and Hezbollah militants to the edge of the Golan Heights. As Assad has consolidated his control, Israelis now worry that Iran and its proxies could maintain a permanent foothold there. Israeli forces in the Golan Heights have sought to both defend Israeli territory from militants fighting across the border and aid rebel groups fighting Iran-backed forces. 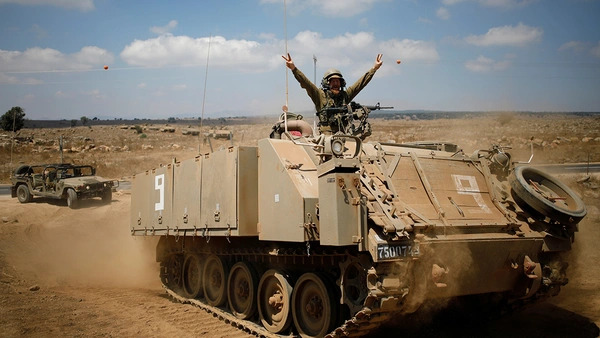 Amid a broader covert war in which Israel has targeted the Quds Force and Hezbollah, Russia has reportedly arranged for the Iran-backed forces to pull back their heavy weaponry fifty miles from Israeli positions. What have been the consequences of annexation? Prime Minister Menachem Begin annexed the Golan Heights in 1981, asserting Israeli civil administration over the territory. Annexation was taken as a transgression of UN Security Council Resolution 242, which passed unanimously after the 1967 war and established the “land for peace” formula. Following this formula, Begin withdrew from the Sinai Peninsula after normalizing relations with Egyptian President Anwar Sadat in the 1978 Camp David Accords. Israel’s annexation triggered a broad backlash: locals rioted; Syria complained to the Security Council, which unanimously reaffirmed that territory cannot be permissibly acquired by force; and U.S. President Ronald Reagan suspended a memorandum of understanding on defense cooperation, as well as $300 million in arms sales. While Begin’s annexation seemed to signal that the Golan Heights was not negotiable as the Sinai Peninsula had been, both left-leaning Labor and right-leaning Likud governments in the years after carried out negotiations with Syrian President Hafez al-Assad, and later his son Bashar, over a possible normalization of relations. A sticking point had been where to draw the border. Syria argued for the 1949 armistice line, while Israel argued for the prior border, established in 1923 by the United Kingdom and France, which controlled the League of Nations mandates there. The gap between the two possible borders is narrow, and in total the amount of contested land is about twenty-five square miles. But at stake was whether Syria could access the Sea of Galilee and its tributaries. In the most recent round of negotiations, in 2010, Netanyahu reportedly was willing to withdraw to the 1949 line in exchange for Bashar al-Assad breaking his ties with Iran and Hezbollah. But Netanyahu broke off those negotiations after the Arab Spring came to Syria in March 2011, when Assad, whose authority appeared tenuous, deepened his dependence on Iran and Hezbollah. What is the upshot of U.S. recognition? Trump’s declaration, made during a visit by Benjamin Netanyahu to Washington, has been seen as a bid to boost the prime minister’s electoral prospects. Seeking to become Israel’s longest-serving prime minister while fending off likely corruption indictments, Netanyahu underscored his ties to Trump in the run-up to a general election. In practice, U.S. recognition of Israel’s claim of sovereignty over the Golan Heights will change little for the territory itself. There is currently no challenge to Israeli authority there. And, as with the 2017 decision to recognize Jerusalem as Israel’s capital, few if any countries are likely to follow the U.S. lead; international consensus that the Golan Heights is occupied territory will remain unchanged. Some analysts say the move will embolden Israeli lawmakers who seek to annex the West Bank—either the 60 percent of it classified as Area C, under Israeli administrative control, or the occupied territory in its entirety. This is already sought by cabinet members and lawmakers in Netanyahu’s Likud Party and other parties on the right. “Everyone says you can’t hold an occupied territory, but this proves you can,” Netanyahu said in late March 2019, returning from his White House visit. Opposition to the U.S. announcement has highlighted common ground among all sorts of rivals: the European Union, Iran, Russia, Turkey, and Saudi Arabia and other Gulf Arab states all condemned the move. So too did both the Assad regime and the Syrian opposition. Who lives in the Golan Heights? Some fifty thousand people live in the Israel-occupied Golan Heights, about half of them Druze who are the remnants of the Syrian population forcibly displaced in 1967 or their descendants. Human rights groups have called for Israel to observe international humanitarian law, which governs military occupations. “Syrians in the occupied Golan face calculated Israeli efforts to restrict their building and land use, destroy their enterprises, cleanse their Arab culture, manipulate their Syrian identity, and suffocate their freedom of movement,” the Golan-based human rights group Al-Marsad said in a statement following Trump’s announcement. Adherents of an offshoot of Ismaili Shiism, the Druze reside primarily in Lebanon and Syria. The Golan Heights Druze by and large remain attached to their Syrian nationality, but the civil war in Syria has disrupted their ties to their brethren in the country’s southwest. Like East Jerusalem Palestinians, Golan Heights Druze do not recognize Israeli annexation and so most have refused Israeli citizenship, maintaining status as permanent residents instead. This distinguishes them from Druze within Israel’s pre-1967 borders, who are the one minority that participates in Israel’s military draft. As the war in Syria has dragged on, a growing number of Golan Druze have sought Israeli citizenship, the Israeli Population and Immigration Authority notes, and one-fifth of the population now holds a passport. The question of whether to participate in local elections, sponsored by Israel for the first time in 2018, has also divided the community. About as many Israeli Jews as Syrian Druze now live in the Golan Heights. They have remade the contested territory into a tourist destination replete with wineries.